One more piece of Chicken’s history was “pulled” into place this week, literally. The old Allis Chalmers HD7, which had belonged to Bob McCombe, a long time resident of Chicken, was drug out of the brush where it had quietly rested for at least the past 25 years and was moved to Chicken Gold Camp and added to the historical collection that compliments the Pedro Dredge. R.S. (Bob) McCombe, one of Chicken’s latter day pioneers, arrived in the Fortymile in 1938 at the age of 36, having been born at the Isle of Man and seeing a lot of the world as a young man. One of Bob’s early ventures in the Fortymile was in freight. He saw possibilities for supplying the miners of that time and started the Fortymile Freight Co, hauling merchandise from Dawson to Jack Wade, a rough 80 miles, for 3 cents a pound. Bob met and married Molly in 1940 at Jack Wade and shortly after found himself delivering old equipment to Whitehorse to construct the Alaska Hwy for the World War 2 effort. During the war years, Bob and Molly lived in Fairbanks and were involved in freighting enterprises on the Tanana and Yukon Rivers. 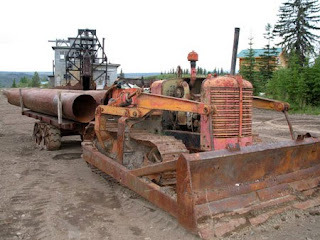 After the war, they returned to the Fortymile, purchased a dozer to do some contract freighting for a dredge company in the 60 Mile and ultimately purchased the roadhouse in Chicken from the Power’s Estate to provide for locals and the occasional overnight visitors who flew into Chicken. Bob obtained a contract to improve the Chicken airstrip and other local airstrips with his Allis Chalmers dozer. Bob and Molly were eventually bought out by the F.E. Co, who used the roadhouse for their dredging operations on Chicken Creek. Bob and Molly then moved to South Fork and established another roadhouse. Bob later entered politics and was elected to the first State House after statehood. Though Bob had traveled the world, he and Molly called Chicken their home and lived out their remaining years on their mining claims along the Mosquito Fork. During Bob’s residency in Chicken he wrote 2 books, “Capetown South Africa to Chicken, Alaska” and “Alaska on the Cover”.